Vida Sacic is an artist and educator from Chicago. Born and raised in Croatia, Vida moved to the Midwest as an exchange student in her teens. She studied graphic design and worked as a designer before returning to school to earn an MFA from Indiana University Bloomington. During her graduate studies, she was introduced to letterpress printing and eventually became fascinated with print. Her letterpress work explores the ties between process and form with an interest in the communicative power of words and formal elements. Vida exhibited solo work at Indiana University Bloomington and participated in numerous group exhibitions nation-wide. Her work has been featured in Fingerprint No. 2: The Evolution of Handmade Elements in Graphic Design, published by HOW Books in August 2011 and For the Love of Letterpress: A Printing Handbook for Instructors and Students, published by Bloomsbury in October 2013. KOLINE 2015 is a single sheet book, created as a companion piece to the book featured in Ritual 2013. The title of the piece is a Croatian term for the traditional feast of slaughtering domestic pigs that takes place in late November. Both books investigate identity and tradition through the lens of this local custom. 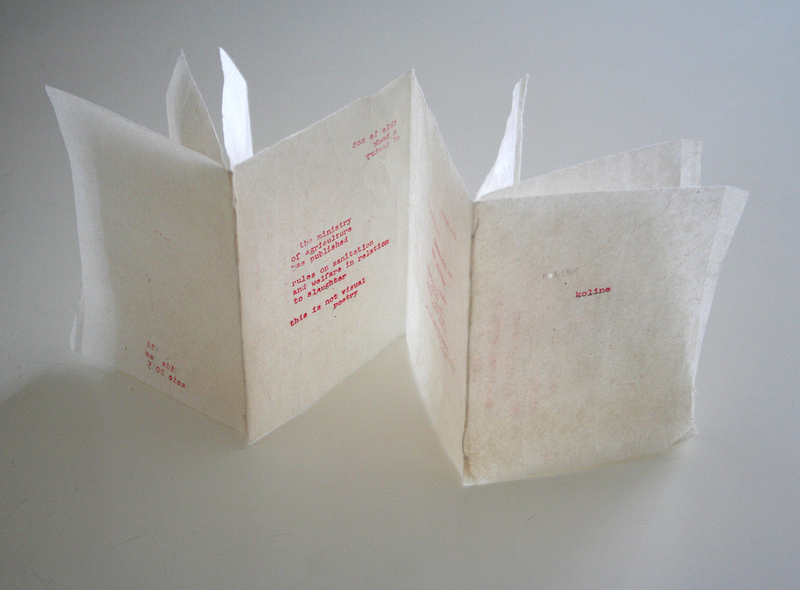 This book was created using a typewriter on handmade kozo paper.